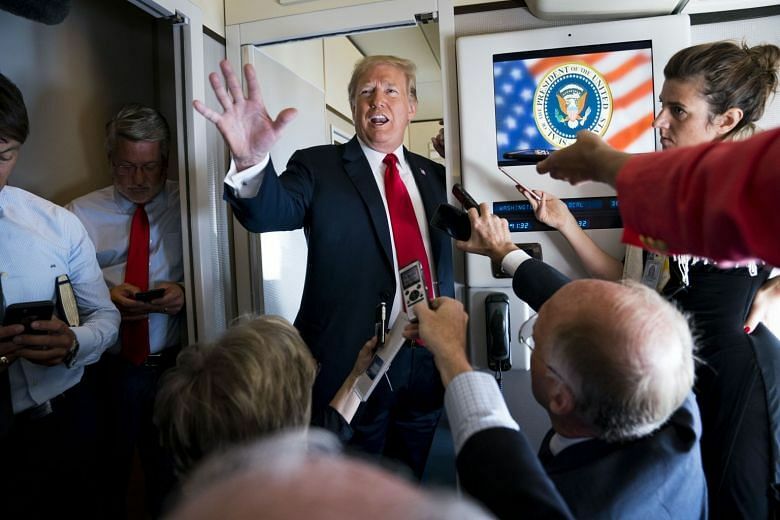 WASHINGTON (WASHINGTON POST) - US President Donald Trump said on Friday (Sept 7) that he is ready to impose tariffs on US$267 billion (S$367 billion) in Chinese goods, on top of the additional US$200 billion that he said will likely be hit with import taxes in a matter of days. The US in July began imposing tariffs on US$50 billion in Chinese industrial imports as Trump moved to confront Beijing over a range of policies that have long vexed American leaders. Stocks dipped after Trump’s comments became public but recovered most of their losses. The Dow Jones Industrial Average closed down about 77 points or 0.3 per cent in mid-afternoon trading. The tariffs that Trump has imposed, and threatened to impose, total US$517 billion – more than the US$505 billion in Chinese goods that entered the country last year. It’s not clear why the President cited the specific figure he used. The White House did not reply to a request for comment. So far this year, US imports from China are running roughly 8 per cent higher than during the same period in 2017. If that pace continued for the remainder of this year, Chinese imports would top US$548 billion – leaving Trump a bit short of complete coverage of Chinese goods. The office of the US trade representative on Thursday finished accepting comments on the next round of tariffs, which could hit up to US$200 billion in Chinese products any day. Many products purchased by consumers, such as refrigerators, spark plugs and furniture, are among the potential targets. Trump’s decision to double-down on his uncompromising stance towards China means little chance of an early resolution of the standoff between the world’s two largest economies. Additional US tariffs are certain to trigger Chinese retaliation, though China’s smaller volume of American imports means that it cannot match Trump’s tariffs on a dollar-for-dollar basis. Chinese officials may respond by subjecting American companies operating in China to unexpected tax audits, custom inspections or even consumer boycotts. “The end game in the US-China trade war has now become even more difficult to discern as both sides step up their attacks and counter-attacks,” said Cornell University economist Eswar Prasad, former head of the International Monetary Fund’s China division. Aboard Air Force One, the President cited the suffering Chinese stock market as an indication that the US is winning the trade conflict. The Shanghai market is down roughly 23 per cent in dollar terms so far this year while the Dow has risen nearly 5 per cent. Despite several rounds of talks between US and Chinese officials, the two countries have made little progress towards resolving their differences. Chinese diplomats complain that the Trump administration lacks a single negotiator empowered to make a deal and is vague about its objectives. As the president readies additional anti-China trade barriers, some economists worry about the economic toll. An intensified trade war would likely hurt the US more than China, according to S&P Global Ratings. By 2021, based on IMF economic forecasts, the US would lose about 1 per cent of its annual output or about US$230 billion while China would lose 0.6 per cent of its US$18 trillion economy that year or US$110 billion. “The direct economic effects of the US-Chain tariff dispute have so far been limited. That may be about to change,” wrote S&P economist Satyam Panday. Some business groups greeted the president’s latest tariff threats with dismay. “The notion that the president is going to add an extra US$267 billion worth of tariffs is grossly irresponsible and possibly illegal,” said Jose Castaneda, spokesman for the Information Technology Industry Council, which argues that the tariffs are not permitted under US trade law.